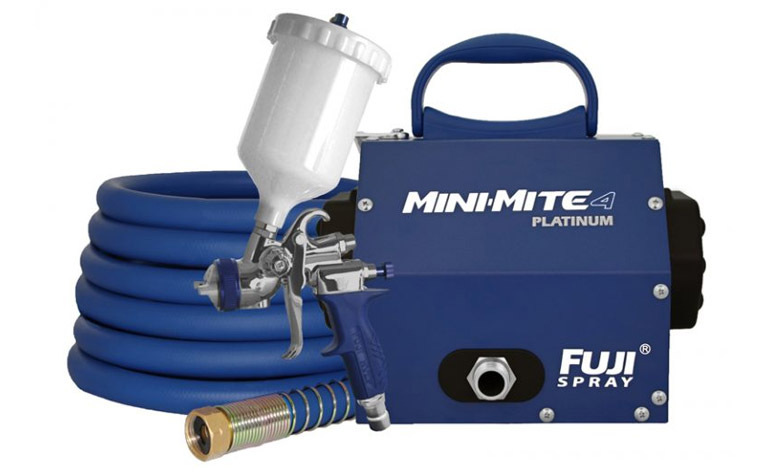 The Fuji Spray® Q PLATINUM™ Series is for those who simply want the best spray experience. Considered the quietest operating turbine on the market today, the Q PLATINUM™ Series is the ultimate tool in terms of power and control allowing you to focus on what really matters – the quality of your work. The patented noise reduction technology coupled with the unique Heat Dissipation Chamber™ makes the Q-Series stand out in the industry. 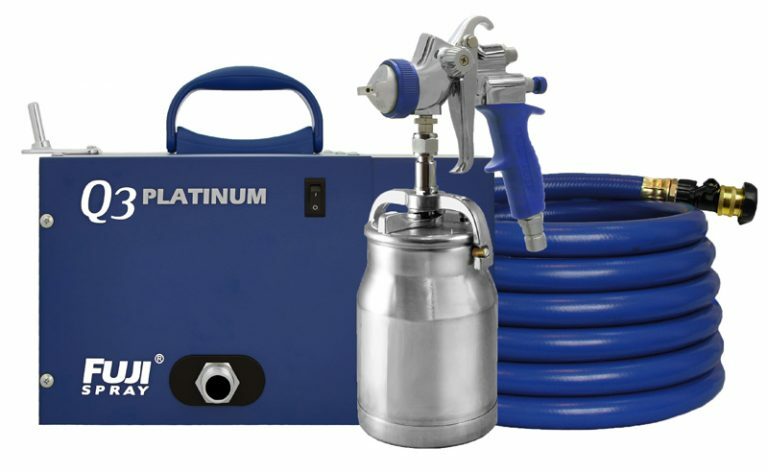 The Q PLATINUM™ Series Systems are perfect for fine-finishing of cabinets, furniture, as well as medium to heavy painting projects. 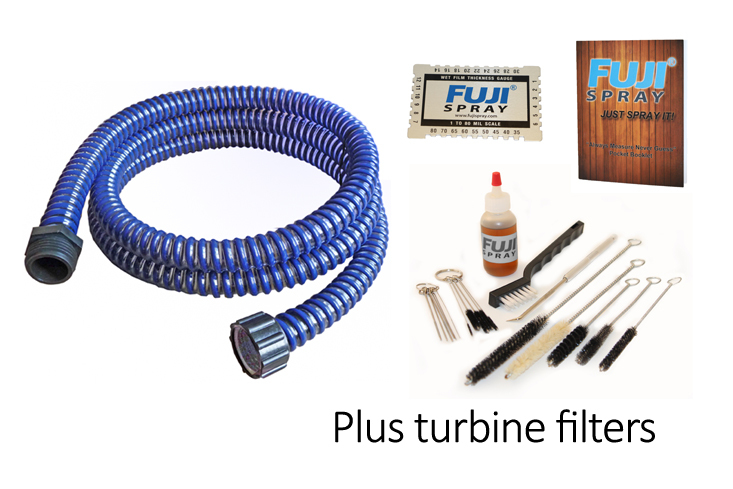 Exclusive to Fuji Spray® –The Fuji Spray Heat Dissipation Chamber™ Fuji Spray has designed a unique method of removing any heat build up from the turbine case. Excess heat is channeled to a Heat Dissipation Chamber™ located at the rear of the case. Since the hot air is dissipated evenly through an optimum surface area of 60 holes, there is no added hiss or loud whistling noise. There is also no blowing around of debris. The benefits of a cooler running unit results in a longer life for your turbine motor compared to standard turbines. 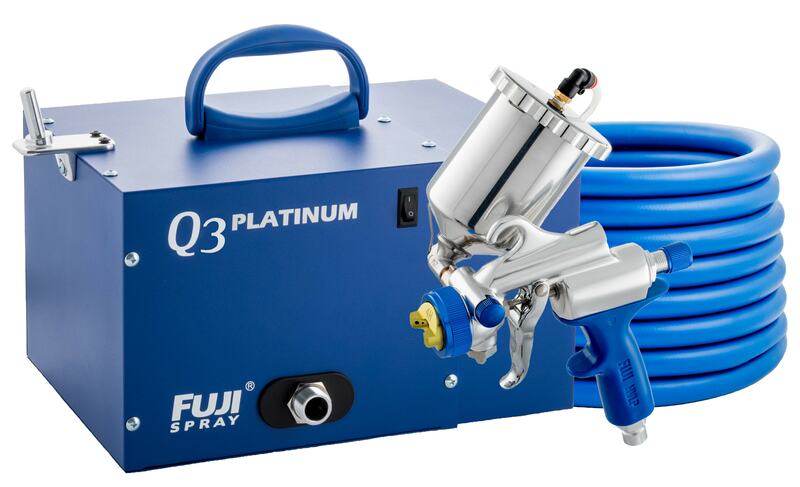 What’s included with every Fuji Spray® Q3 PLATINUM™ HVLP System? 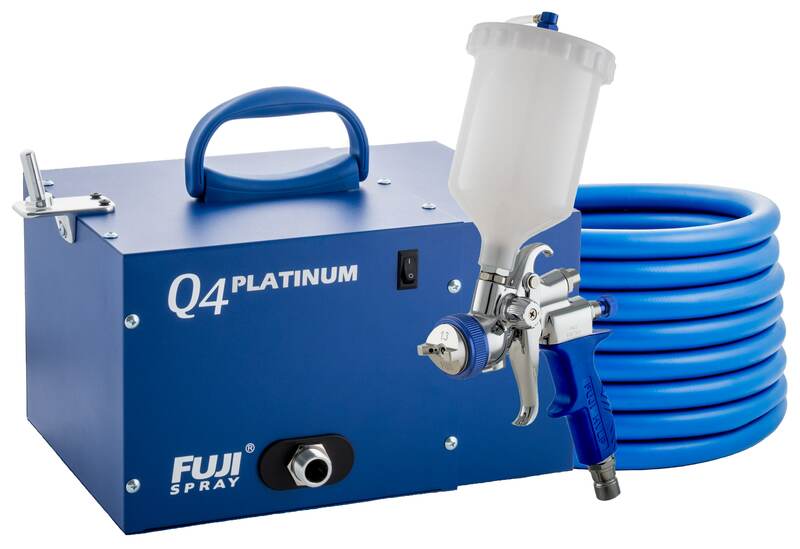 What’s included with every Fuji Spray® Q4 PLATINUM™ HVLP System? 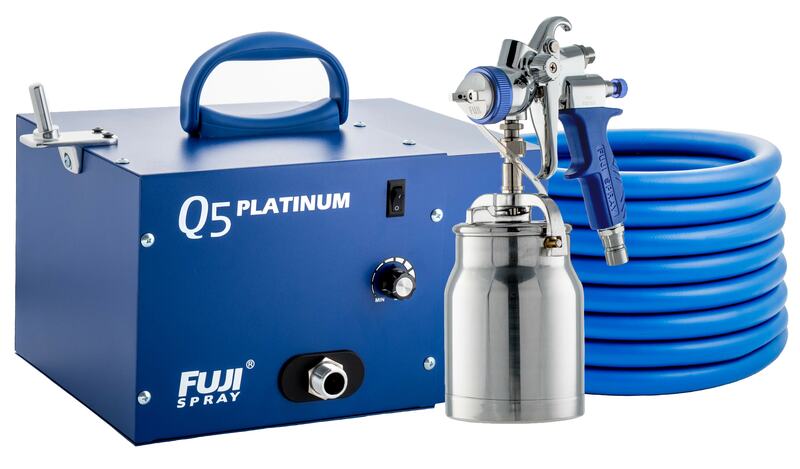 What’s included with every Fuji Spray® Q5 PLATINUM™ HVLP System? 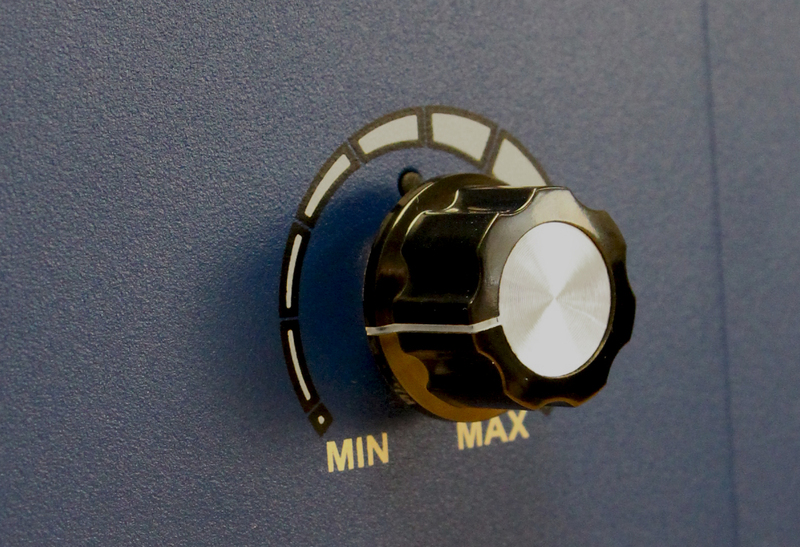 What is Noise Reduction Technology? One of the most desirable features for any turbine is to have it be as quiet as possible. A standard turbine sounds like a loud vacuum cleaner. The noise level of a standard turbine is so loud, that over time it can contribute to hearing loss. Many woodworkers use ear protection, but if you have a smaller shop with neighbours (or have employees working in the same area), we recommend choosing a model from the Q PLATINUM™ Series. Fuji Spray® has reduced turbine noise levels by over 50% without causing any unwanted challenges, such as overheating through air restriction. Fuji Spray® does not surround the turbine motor with soundproofing material, but rather uses a method that allows the turbine motor to sit in an all-metal enclosure the way that standard turbines do. The Fuji Spray® Quiet turbines have computer-designed airflow configurations that completely eliminate ‘direct sound paths’ found on ALL low- to mid-priced HVLP turbine systems available today. These direct sounds paths, or DSP’s, are responsible for the noise. In fact, when the Fuji Spray® Quiet turbine is placed across the room, the low hiss of air passing through the spray gun when the trigger is engaged is more noticeable than the turbine. Fuji Spray® Q PLATINUM™ Series turbines are protected by US Patent No.6644913. At 15ft, the Q3 PLATINUM™ Turbine is only 61 dba, and at 20ft, it is 58 dba. 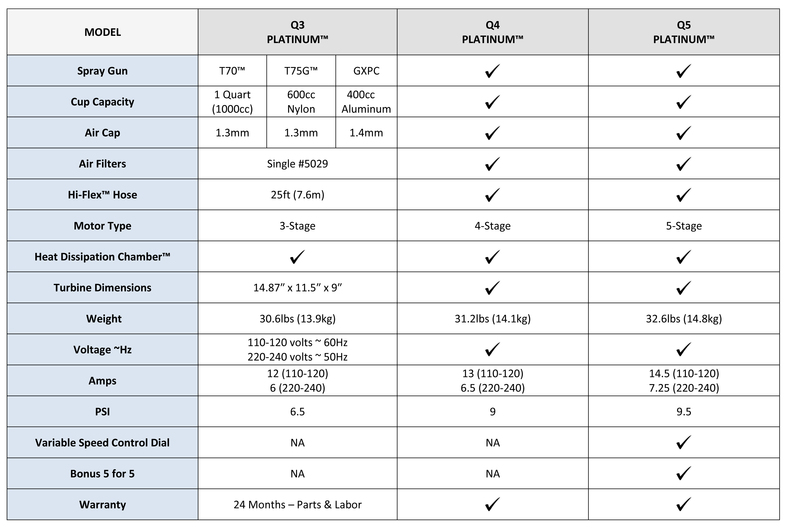 At 15ft, the Q4 PLATINUM™ Turbine is only 62 dba, and at 20ft it is 59 dba. At 15ft, the Q5 PLATINUM™ Turbine is only 63 dba, and at 20ft it is 60 dba. Compare this to a standard turbine at 79 dba from 15ft and 77 dba from 20ft. normal conversation is 60 dba. The Q PLATINUM™ Series turbine. There are no quieter turbines on the market today. 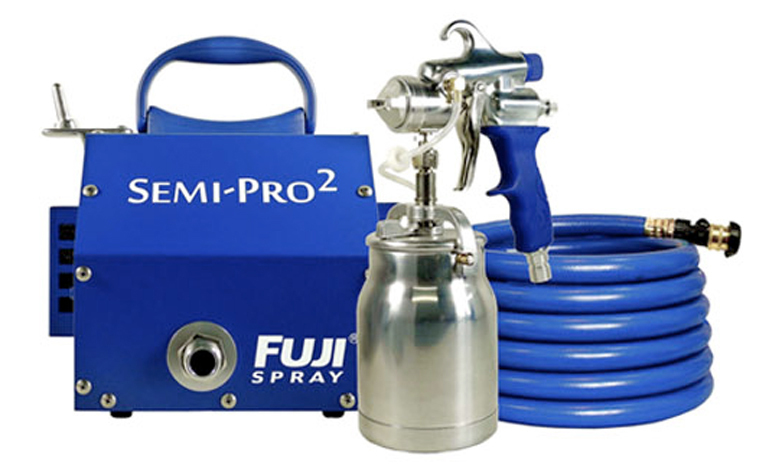 Have you recently purchased a Fuji Spray® Q Series HVLP Spray System? Congratulations on getting yourself the quietest turbine on the market, with the power, speed and versatility that’s ideal for professional use.